Open out the carcass like a book, press flat and place in a roasting tray. In a pestle and mortar or with a rolling pin and a metal bowl, bash and bruise the flavour out of the herbs, squash in the garlic cloves and pour in the olive oil. Mix and rub all over the chicken they lay it out flat, skin-side up, and grate over half the ginger. If you have time, leave it for a couple of hours to marinate. Preheat your oven to 220°C/425°F/gas 7. Season the chicken well after marinating and place it in the preheated over for 30 minutes. 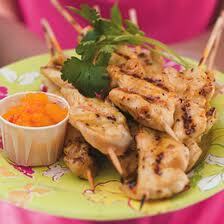 Remove and lay the lemon slices over the chicken, then grate the rest of the ginger all over. Tilt the tray and spoon over all the lovely cooking oils before adding the wine to the tray and cooking for another 20 minutes or until nice and golden and cooked through – the juices should run clear. Alternatively, you can use chicken breasts and cook in the preheated oven for 30 minutes. Remove from the oven and rest for 10 minutes before serving..enjoy it !